An action spy thriller directed by Abhinay Deo. Produced by Vipul Amrutlal Shah, Viacom Motion Pictures and myself. Once again I play ACP Yashwardhan, a no-nonsense police officer still grieving over his wife Maya who died five years previously. 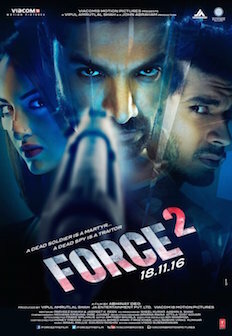 The film is a sequel to the 2011 release Force. It follows Yash on a cat and mouse chase through Budapest as he teams up with a female RAW agent played by Sonakshi Sinha to track down a ruthless and clever suspect. "I hurt my knee very badly during the shoot so this film literally has my blood and sweat in it. We tried our best to bring Hollywood standard action to the film. I hoped we succeeded."